The mismatch between tools in the QA process is a common concern of testing teams. It can affect their productivity, cost, and time to complete testing activities. Thus, testing teams should know how tools work together before deciding to use them. Testing teams increasingly apply test automation in addition to their traditional manual testing for their projects. They need a complete test solution that allows them to plan, manage, track, and analyze both manual and automated testing activities and artifacts. This solution may enable test managers to have a complete view of test coverage and testing status. Unfortunately, such a solution currently does not exist, and test managers opt to use and integrate multiple tools. 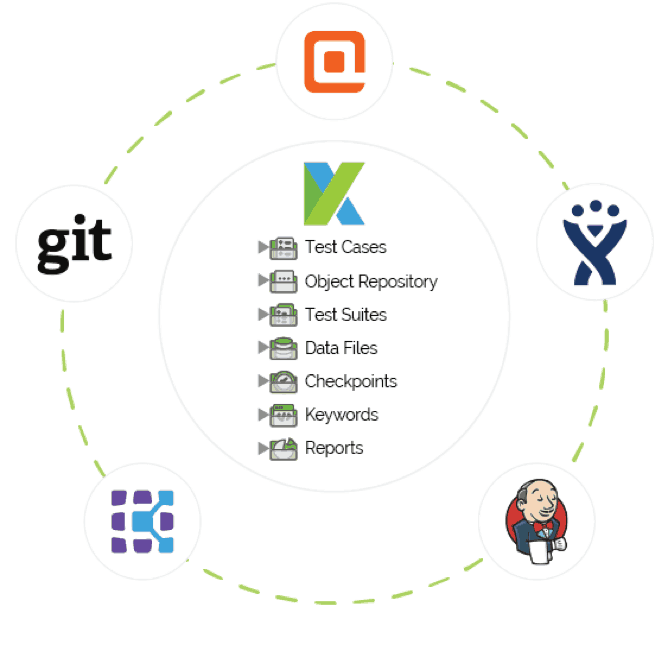 To help address the integration mismatch issue, Katalon Studio is built to work smoothly with popular tools in the QA process, including qTest, Jenkins, Git, and JIRA. 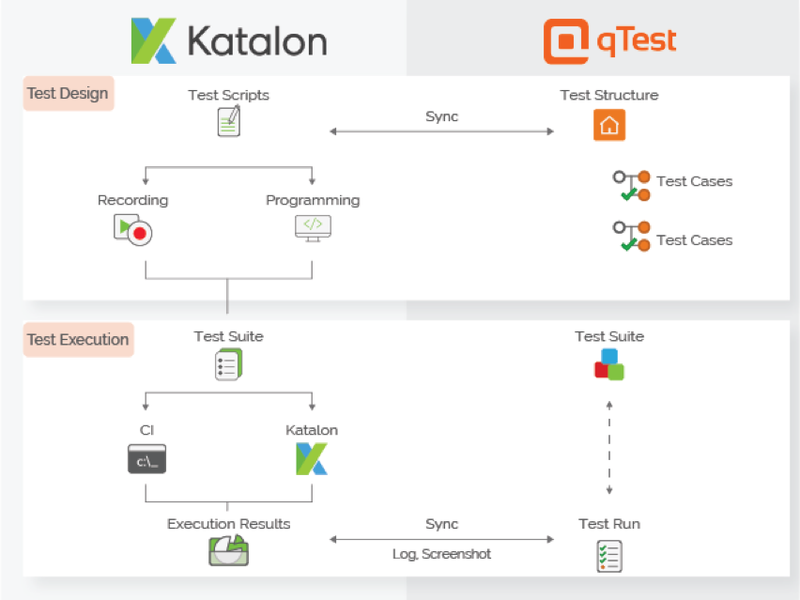 This article provides details on how Katalon Studio can work with qTest Manager to seamlessly integrate test automation activities and artifacts into the QA process incorporated in qTest. qTest is a cloud-based test management system developed and operated by QASymphony. The system allows users to manage, track, and reports all testing activities and artifacts in agile software projects. Integrating with Katalon Studio allows the system to augment test automation effectively. The integration between Katalon Studio and qTest brings benefits to the users of both systems. Test managers can assign test automation tasks in qTest for test engineers who use Katalon Studio to perform their tasks. Automation test results and execution outputs are synced to qTest automatically. Test managers and engineers can collaborate effectively as testing activities, test cases and results from both manual and automated testing can be viewed and interacted from the integrated system. This integration also allows test managers to leverage qTest reports to better manage test coverage and activities. The screenshot below shows how qTest’s test cases link and sync with those in Katalon Studio. They can be unlinked to be maintained separately in each system. After being synced, test managers can assign test automation tasks appropriately. Test cases can be assigned to testers with less programming experience to create test scripts by using the recording feature. 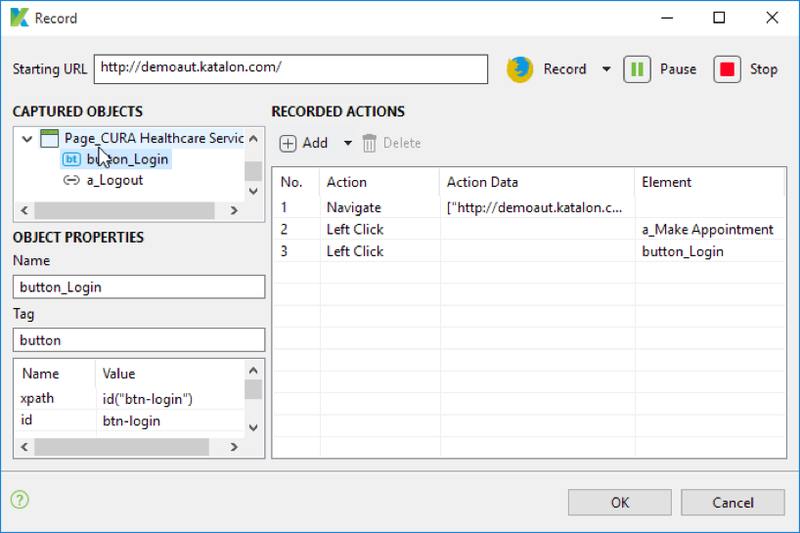 Automation engineers who have more programming experience can use the Script feature in Katalon Studio to create and edit advanced test scripts. 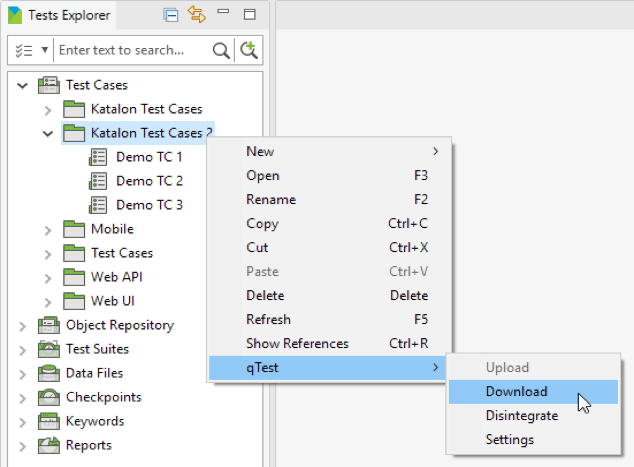 Test case descriptions and steps from qTest can be automatically copied to Katalon Studio to be used as the guideline for generating automated scripts. Automation engineers can work with manual test cases and upload them back to qTest once finished. qTest helps test managers set up test design across manual and automation teams and keep track of test coverage. One common test strategy is that new features are tested manually and regression features should be validated by automation. By doing this, test managers can allocate resources and time more efficiently while promoting effective collaboration among the manual and automation testing teams. After execution, test engineers can manually upload a single test result to qTest or choose the automatic option to upload all test results. qTest becomes a central test management tool that test managers can rely on to analyze the product quality without going to another system. On top of that, Katalon Studio provides qTest users with sufficient information for automated testing bugs which can be submitted to another bug management system like JIRA. 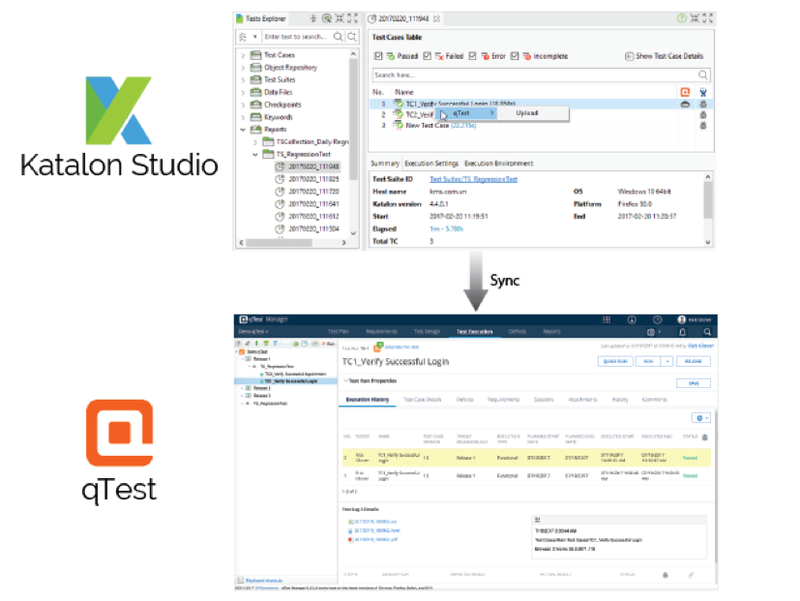 In the next article, we will demonstrate the capability to integrate Katalon Studio with qTest via CI plugins so that project teams following continuous delivery can leverage the two systems to achieve better test outputs. Visit Katalon Studio to download the free automation test solution built by KMS Technology, a QASymphony sister company.